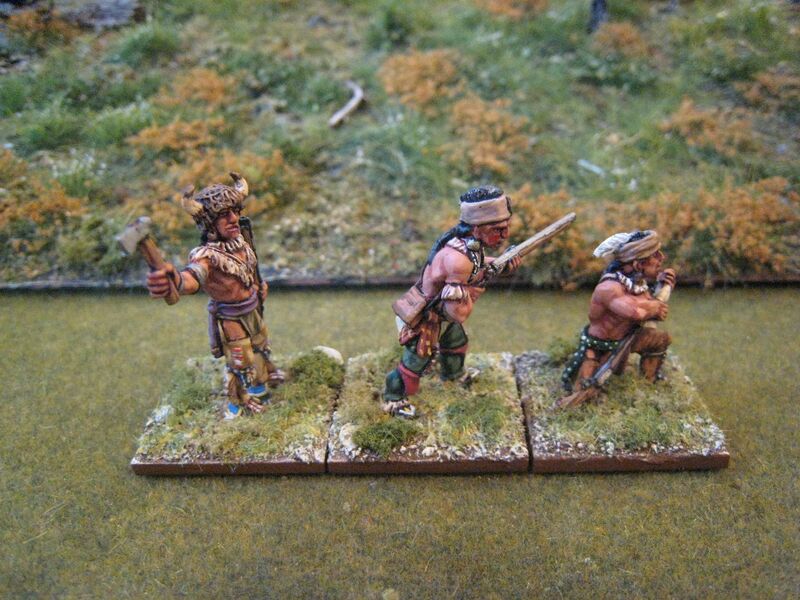 This is another Conquest Miniatures pack, "Sauk & Fox Indians A". The Sauk (or Sac) and Fox people were distinct tribes that (I believe) came together in the 1730s to provide mutual shelter and support as a result of conflict with the French and other indigenous tribes. The Sauk settled around the Michigan area and then were forced to move south to northern Illinois and Wisconsin, where they met Fox refugees who had also been forced away from their original homelands around the Saint Lawrence River. The Fox had suffered from hard fighting with the French (apparently one of Louis XIV or XV signed a decree ordering the complete extermination of the tribe). Eventually the tribe became known as the Sauk and Fox Nation. One of the best known Sauk was Black Hawk, who went to war with the US government in 1832. In 1804 the US government had "bought" tribal lands east of the Mississippi and by the late 1820s that land was being prepared for white settlement. The Sauk were told to move, in accordance with the treaty of 1804, which most did; despite there being disagreement over the terms of the treaty and precisely how much land and purportedly been sold, many member of the tribe did not want to provoke more fighting. A small group under Black Hawk decided to stand their ground. This group became known as the "British Band" because they sometimes flew a British flag to defy claims of US sovereignty, and because they hoped to gain the support of the British across the border in Canada. Other nearby Indian tribes that had grievances against encroaching white settlement joined Black Hawk and fighting between the band and local militia broke out. After initial successes, the British Band were eventually overwhelmed by numbers. General Winfield Scott led a column of militia and regular army, together with allied Indians, that won the decisive Battle of Bad Axe. Black Hawk was captured shortly thereafter. He was released from captivity a few months later and died in 1838 at the age of 71. 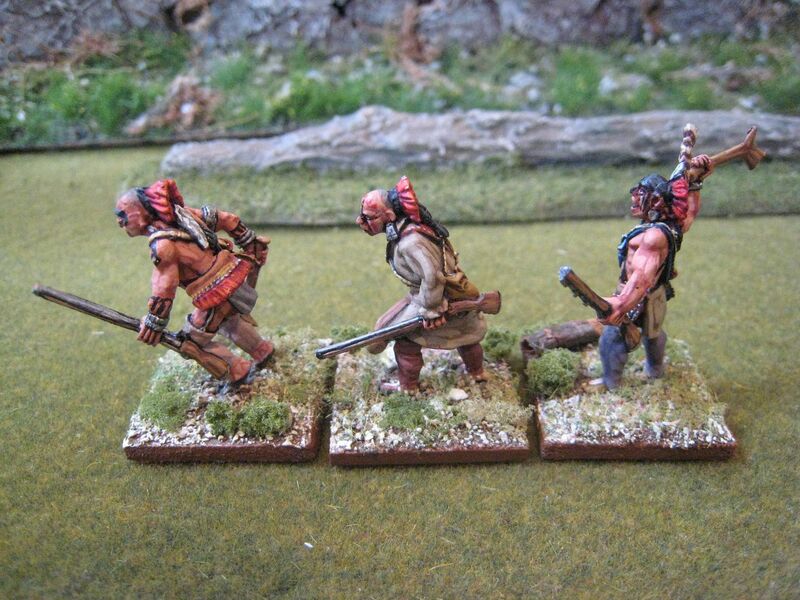 There is a bit of information about the Sauk and Fox people in the various Osprey MAA books on the Indian tribes, but I confess that the colour scheme used on these figures are largely my own invention. As with other recent figures, I've tried to use muted colours for leggings and shirts, while adding some colour on sashes, wampum bead decorations and satchels. These figures are probably not that authentic - as I've explained before, I just don't know enough about the dress habits of the various Indian nations to know how to differentiate the figures in these Conquest packs. 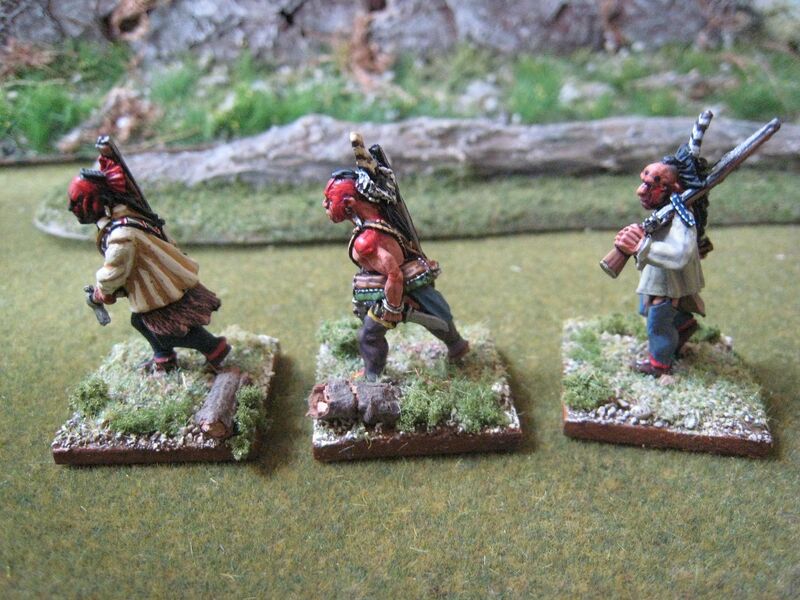 I also don't know whether these figures are dressed for the 1770s or the 1830s - given that Conquest make a Black Hawk figure, I suspect the latter; but I'm sure these will do for the AWI. One of the figures is wearing a buffalo headdress - an Osprey MAA states that this headgear would have been looted from another tribe. As always with Conquest, these are attractive figures, nicely posed and with interesting little details. 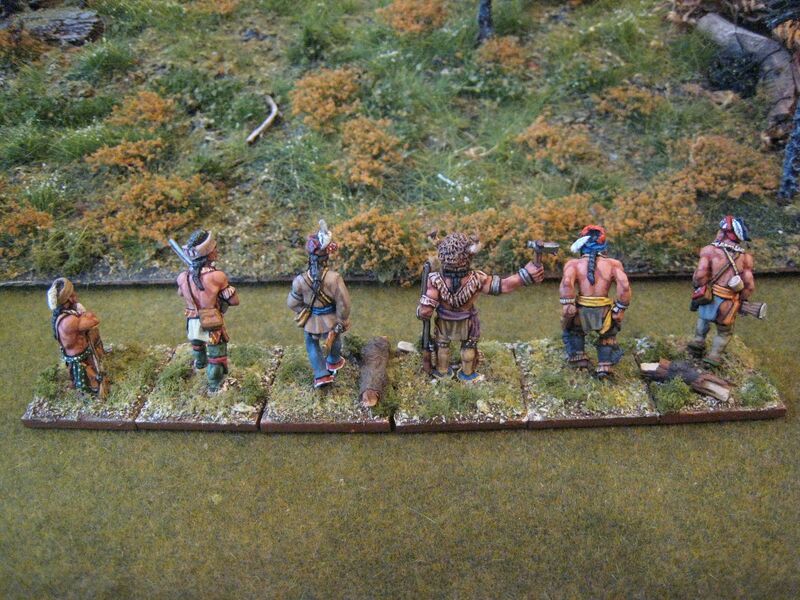 I've just finished another pack of Iroquois and then that's it with Indians for a while, although I'm sure I'll paint the second Conquest Sauk/Fax pack in due course, maybe Black Hawk too. 6 figures. Painted November 2016. 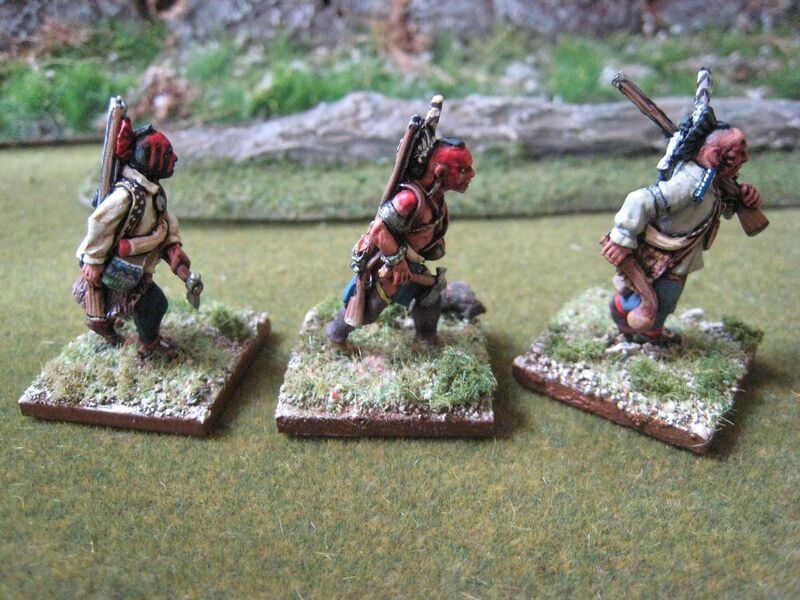 This is one of the two Conquest Miniatures packs called "Frontiersmen". 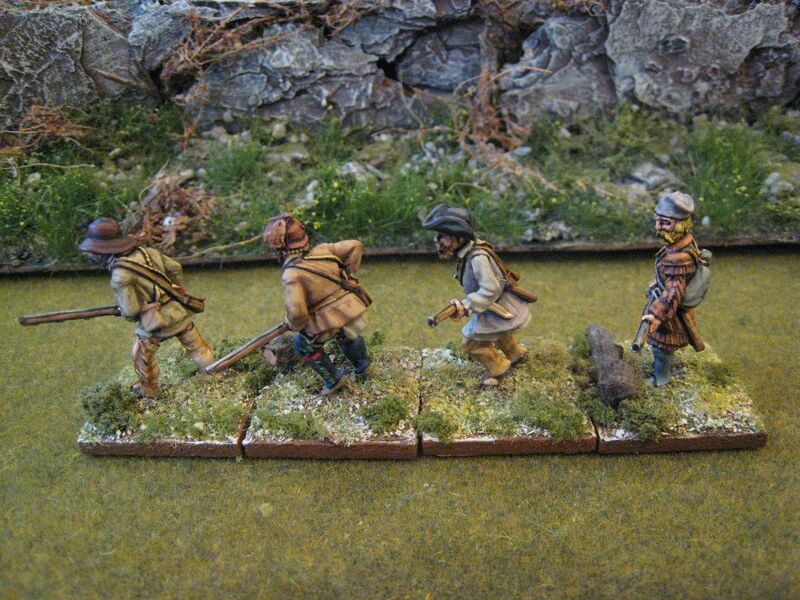 I've had this pack in the leadpile for years and knocked it off a few weeks ago as part of my plan to paint most of my outstanding AWI lead by the end of the year. I have 3 or 4 full battalions to go, but much of what's left in my AWI box is odds and sods - command figures, a few cannon, and various packs from Conquest and Old Glory. 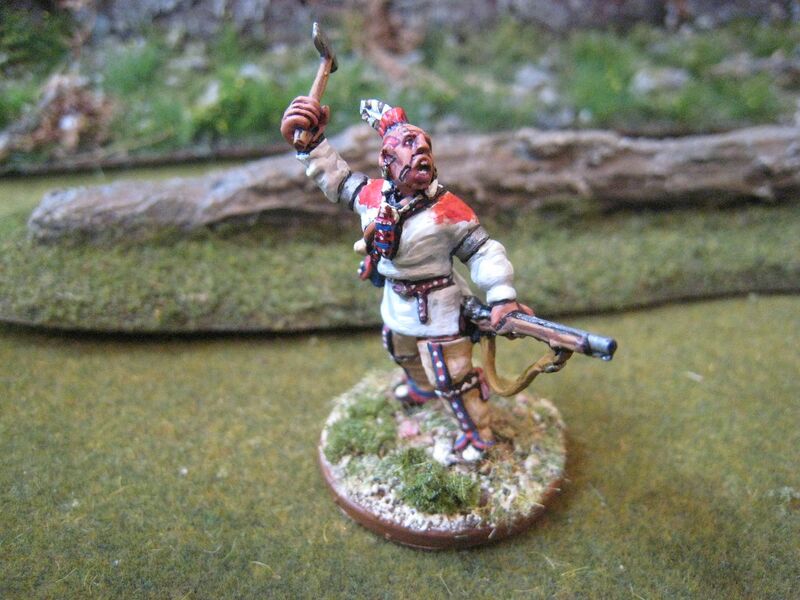 This is another Oriskany-inspired unit, as the "British Grenadier!" 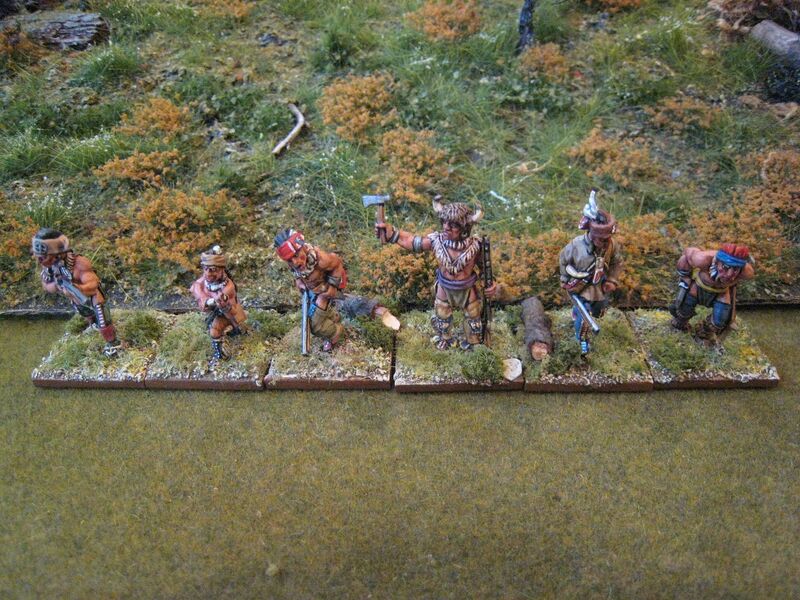 scenario requires a couple of units of skirmishers or "rangers" on Patriot side. So these figures are something of an American counterpart to the Loyalist rangers I blogged about here. I'm not lacking in skirmishing Patriots. 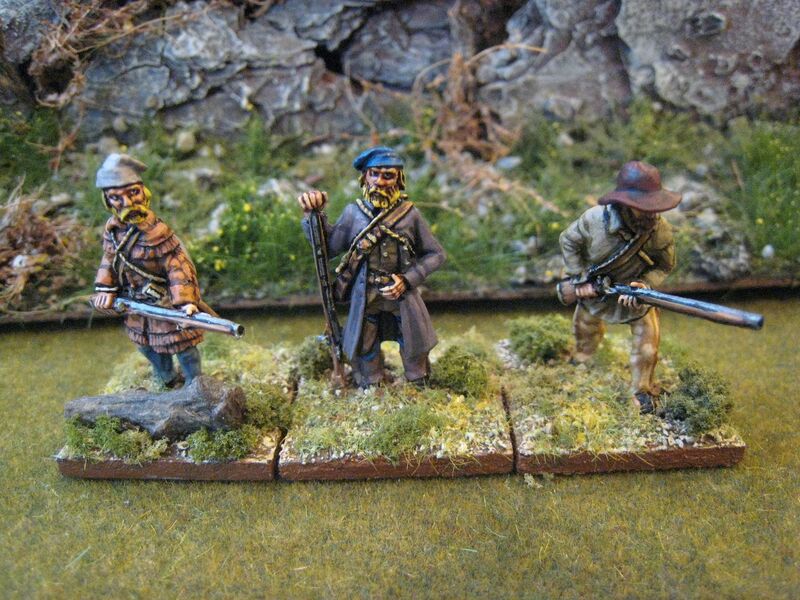 I already have Perry Miniatures riflemen based as skirmishers (see here and here) and a unit of "over mountain men" from King's Mountain Miniatures (see here). 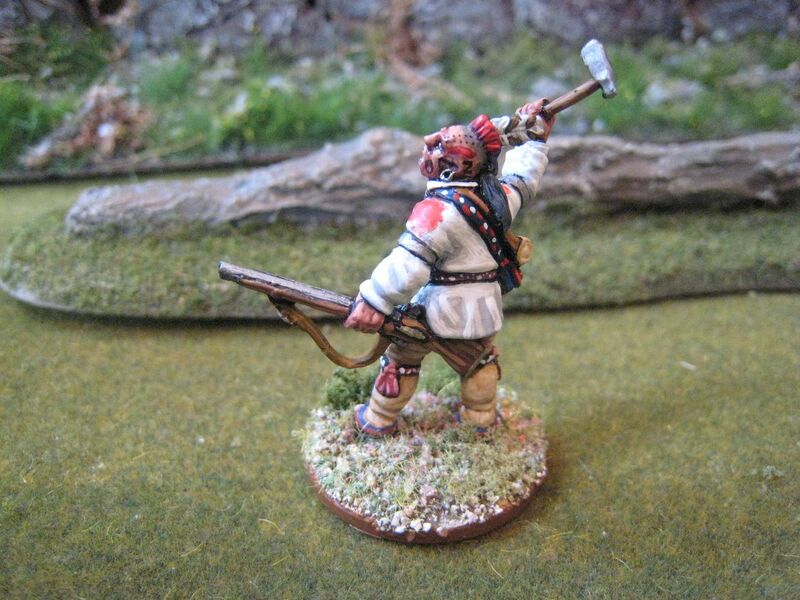 I also have a 9 skirmishing Front Rank militia, which form one of the first units I ever painted for the AWI (for Bunker Hill) and which I've never blogged about. I haven't taken a size comparison photo, but in terms of size the KMM figures are the largest and Conquest the smallest, with Perry somewhere in the middle. 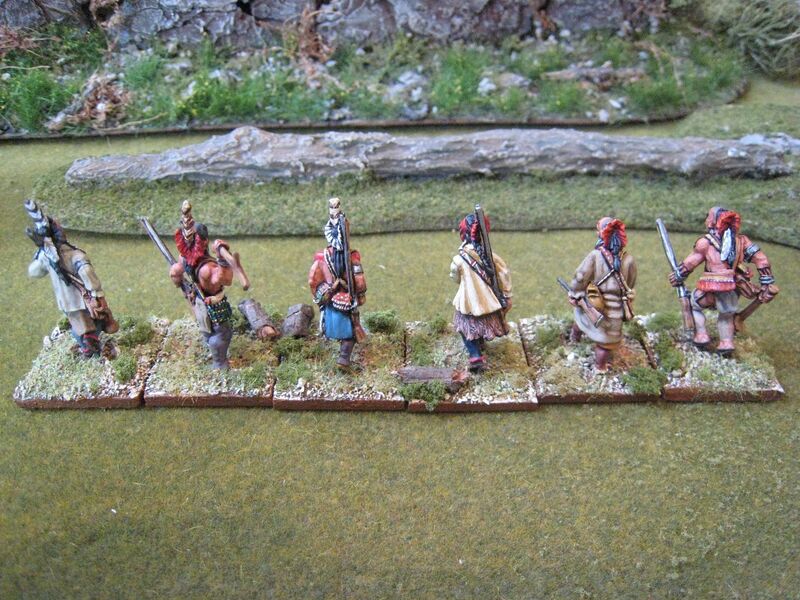 That said, they are all an effective "28mm" size and look fine in the same game. If you look at my earlier riflemen units you can see that I've been inconsistent in how I've based them. The "British Grenadier!" 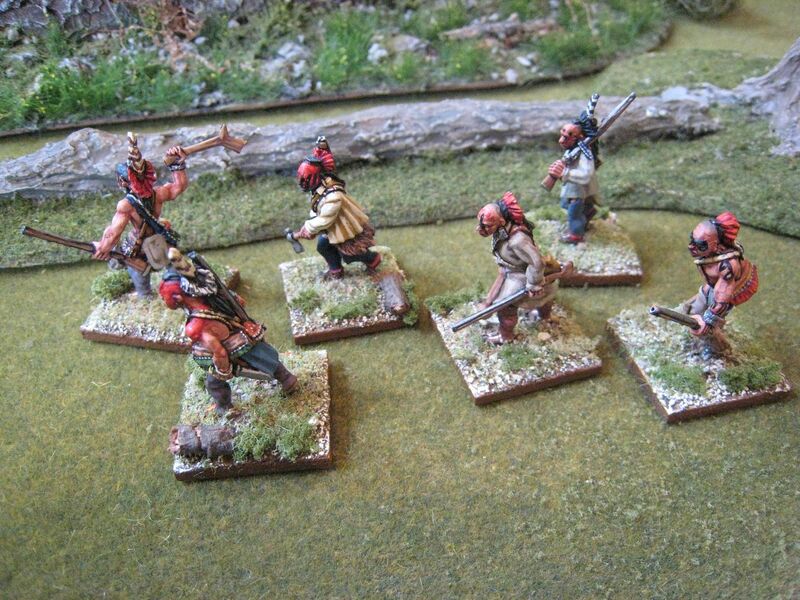 suggested base sizes are twos on 50mm x 25mm or threes on 75mm x 25mm (depending on the grade of skirmisher), but I had to use larger bases for some of the Perry figures. 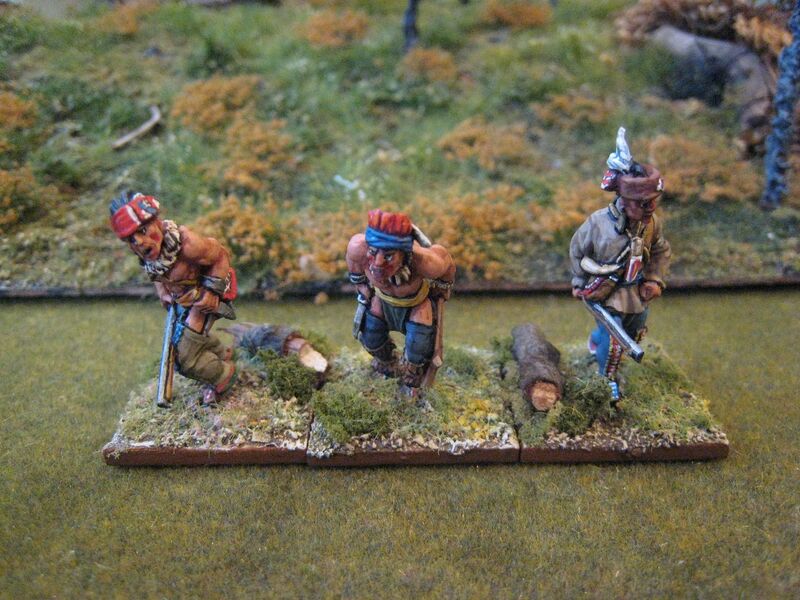 Otherwise I've largely based these riflemen types in pairs, but with Oriskany and the French & Indian War in mind I decided to base this pack on single bases of 25mm x 25mm. 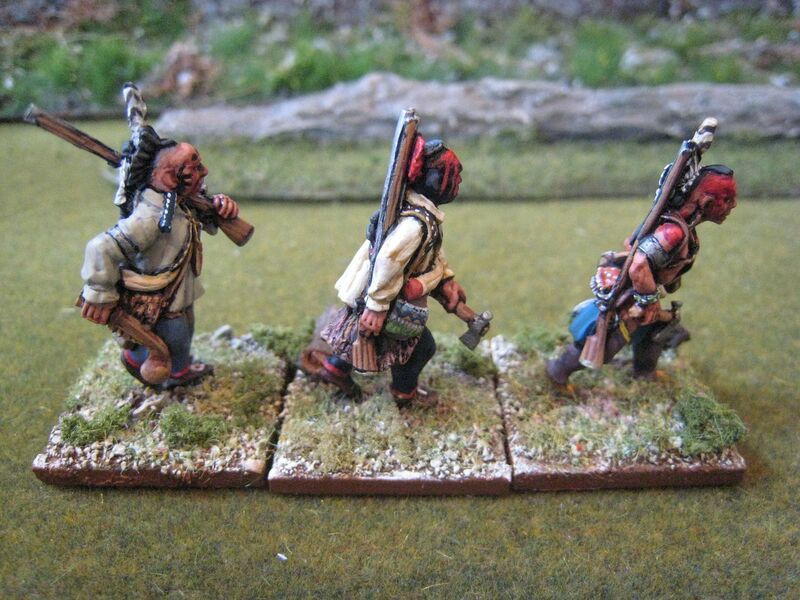 There's not much else to say about these figures, so I'll take this opportunity to run down the "British Grenadier!" 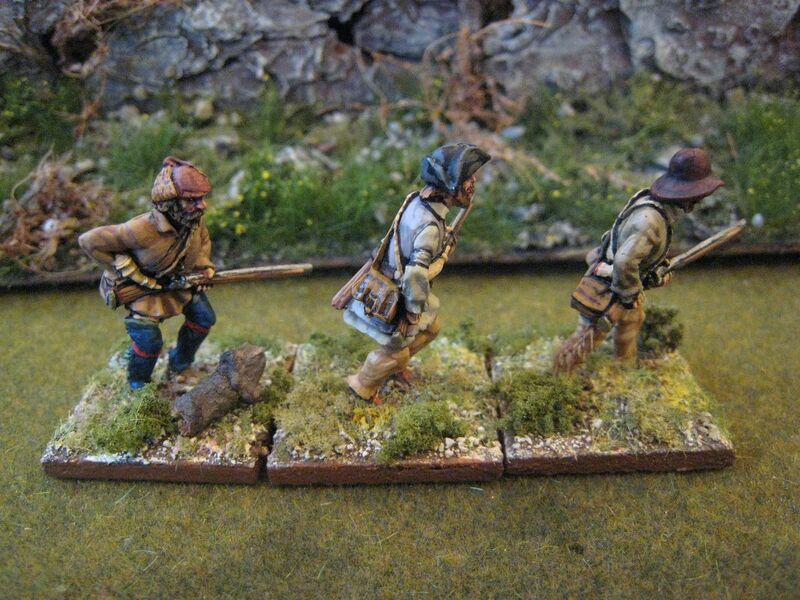 scenario requirements for these sorts of riflemen/militia skirmishing units (this list doesn't include Continental Army units in skirmish formation). 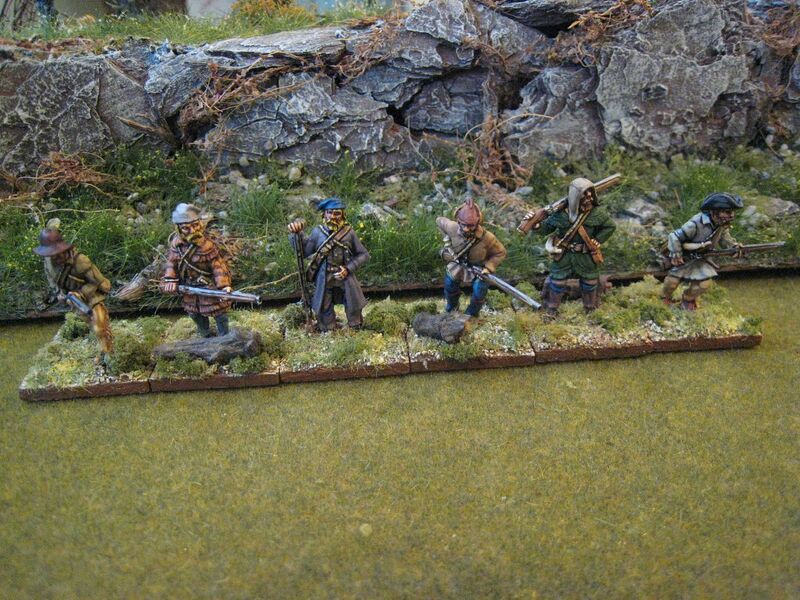 Incidentally, the rocky outcrop in the background, which has been featuring in recent photos, is a lovely piece of terrain hand-made by KMM proprietor and chum Bill Nevins - more on that soon. Currently on the painting table are more loyalist, using Perry plastics and KMM metals. 6 figures. Painted September 2016. Hanyery (or Han Yerry) Tewahangarahken (c. 1724-1794) was a warrior of the Oneida tribe who fought on the Patriot side at the battle of Oriskany in August 1777. I gather his name means "He Who Takes Up the Snow Shoe" and he was the son of a German father and a Mohawk mother. The Oneidas were one of the founding tribes of the Iroquois Confederacy and lived in what is now central New York state. When war broke out in 1775 the Iroquois were initially neutral but the tribes eventually had to choose sides and whilst most remained loyal to the Crown the Oneida sided with the Patriots. 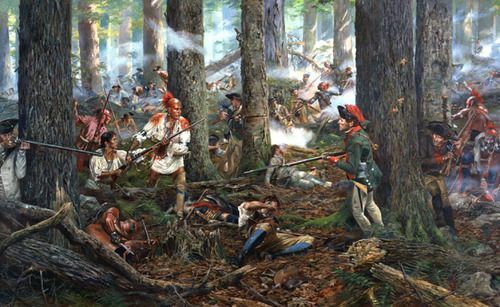 The Oneida acted as scouts and around 50-60 warriors, including Hanyery, fought with Brigadier-General Herkimer's militia force at Oriskany. By this time Hanyery was a prominent member of his local community and a prosperous farmer. At the battle Hanyery was accompanied by his wife Tyonajanegen (meaning "Two Kettles Together") and his son Cornelius. The story goes that Hanyery was hit in the wrist by a musket ball and Tyonajanegen helped him reload his rifle. In a contemporary article about the battle in the "Pennsylvania Journal and Weekly Advertiser", Hanyery is reported as having killed nine of the enemy (being a mixed force of Loyalists and other Iroquois) and Cornelius two. Tyonajanegen survived the battle as well and rode off to tell local people the outcome of the battle. Hanyery and Tyonajanegen continued to serve with Patriot forces during the Saratoga campaign. General Gates apparently arranged for three gallons of rum to be sent to them and their family as a reward for their services. It seems that at some time during or after the campaign Hanyery's house and farm were destroyed by pro-British forces. This figure is from Galloping Major that I acquired when I bought all their F&IW militia packs (which I turned into a unit of Loyalists). The figure is sold separately as a "heroic Mohawk warrior". 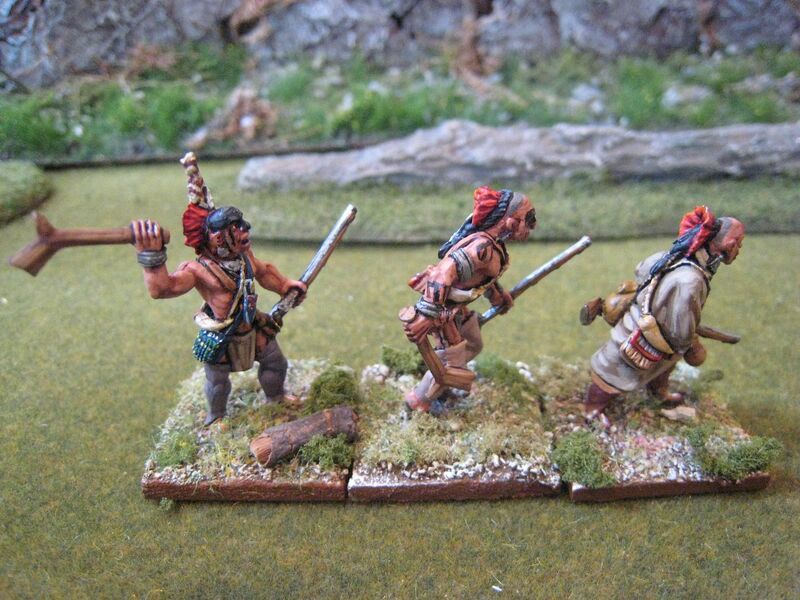 I painted it at the same time as some Conquest Miniatures Iroquois. The GM figure is noticeably taller and stockier than these other figures and so I thought about how I might use the figure by itself, perhaps as a personality. I had been looking at Don Troiani's wonderfully atmospheric painting of the battle of Oriskany (see right) and I realised that the GM figure looked just like Hanyery in that painting (prior to his injury). The "British Grenadier!" orbat for Oriskany lists 6 Oneidas as part of one of the Patriot brigades. No leader of this band is mentioned, but I thought it would nice to paint up a figure of Hanyery, base him as a chief (so on a 2p piece) and have him as the leader of 5 other figures. Based separately, the extra heft of this figure won't be so noticeable. Incidentally, while I've admired this painting for years, I hadn't noticed that Troiani has painted Herkimer sitting propped up against a tree directing the battle. I'm on a bit of an Oriskany roll at the moment, with more Iroquois and the KRRNY (as depicted in the Troiani painting) in the works. 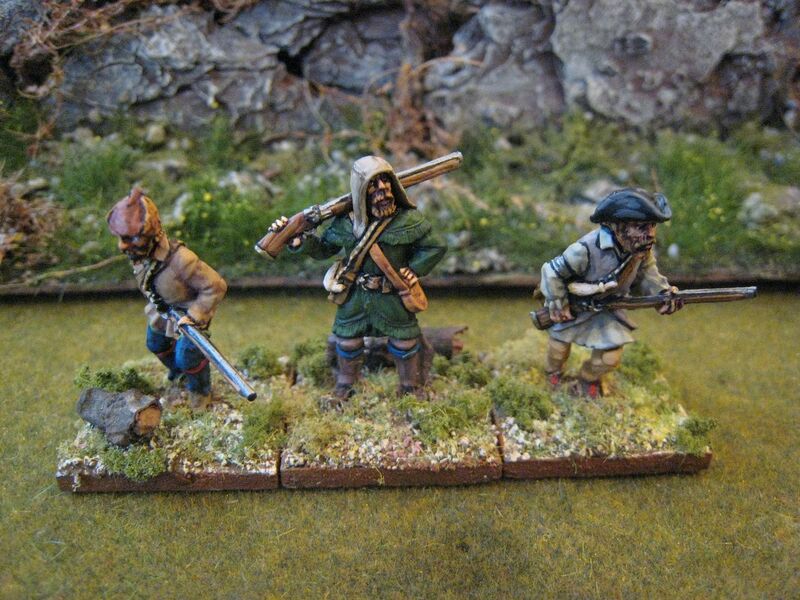 I have a couple of GM militia characters left which I'm now minded to paint as other personalities from Oriskany and the Saratoga campaign more generally. I tried to follow the colour scheme of Hanyery as he appears in the Troiani painting. The clothing and equipment are not identical, so a bit of improvisation was required, especially on the leggings. I tried to replicate the facial paint as closely as possible, but I had to leave out some of the detail around the ears. I'm not sure that the figure in the painting looks like someone in his early fifties, but I suppose Hanyery would have been very fit for his age. It was only when I finished the figure that I realised the colour scheme is very "red, white and blue". But I'm pleased with the way the figure came out and I enjoyed reading up about Hanyery and his family for this post. I'll have to look for a suitable Tyonajanegen now; or perhaps try to hassle Lance at Galloping Major into making one. 1 figure. Painted October 2016. A comparison pic, as a request for such often appears on TMP. From left to right: Perry, Galloping Major, Conquest. The Conquest figures are slighter, and the GM ones quite chunky. But these are fully compatible, in my opinion. 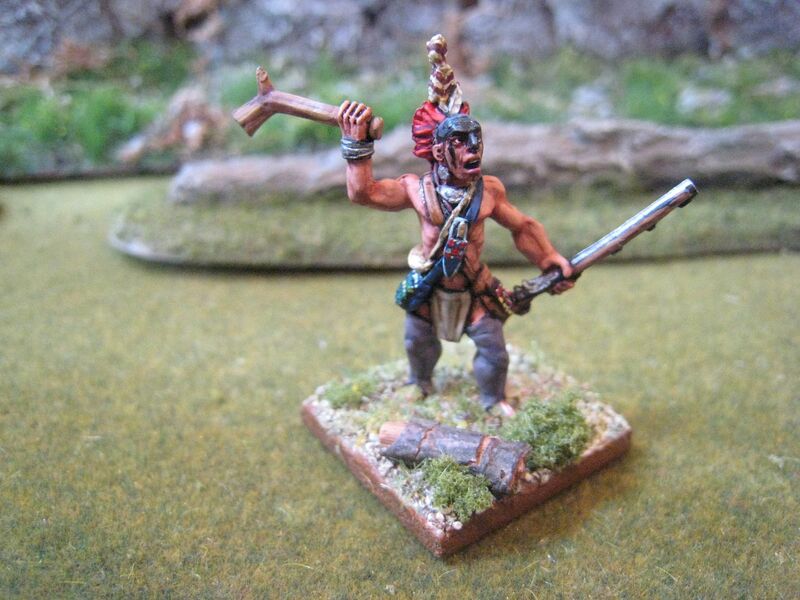 One of my very first posts on this blog was about Conquest Miniatures' French & Indian War range, 18 woodland Indians that I'd painted in 2006. 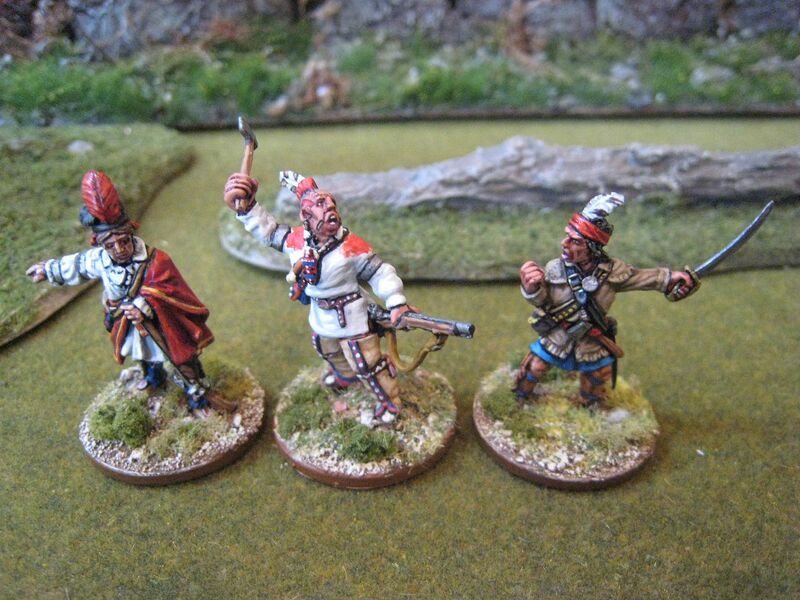 Ten years later, here is another pack from Conquest (sold in the UK by Warlord Games). I wish I'd blogged about those earlier figures on a pack-by-pack basis, because I can't now find them on either the Conquest or Warlord websites. 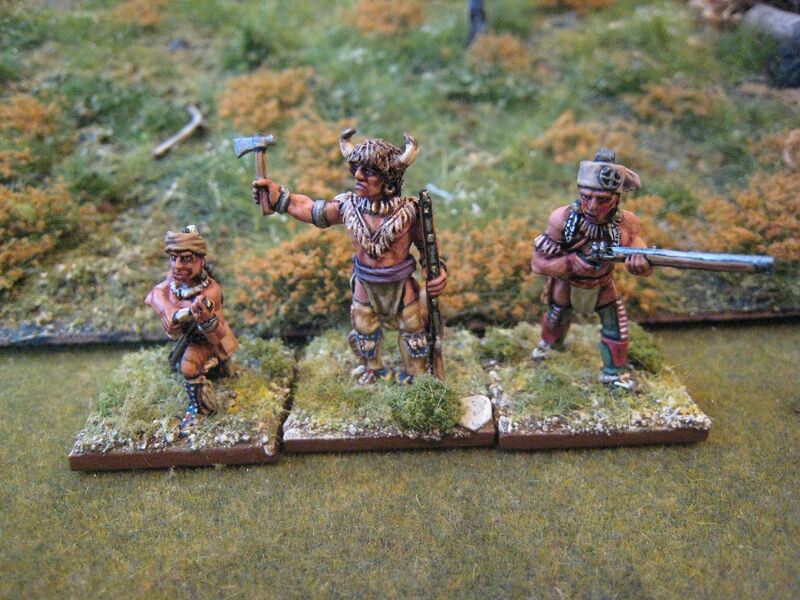 I think they started off as being sold as "generic woodland Indians", but then some figures were re-packaged as particular tribes. I see a few of the figures are now sold as "Miami" and "Ottawa", but I think some sculpts have disappeared into the ether and those packs contain other figures I haven't seen before. Anyway, I've always been a fan of the Conquest range. The figures are smaller and "slighter" than those of Perry, Galloping Major and other brands, but they are terrific animation and lots of detail. I've had various other packs in the leadpile for several years and I'm slowly working my way through them. 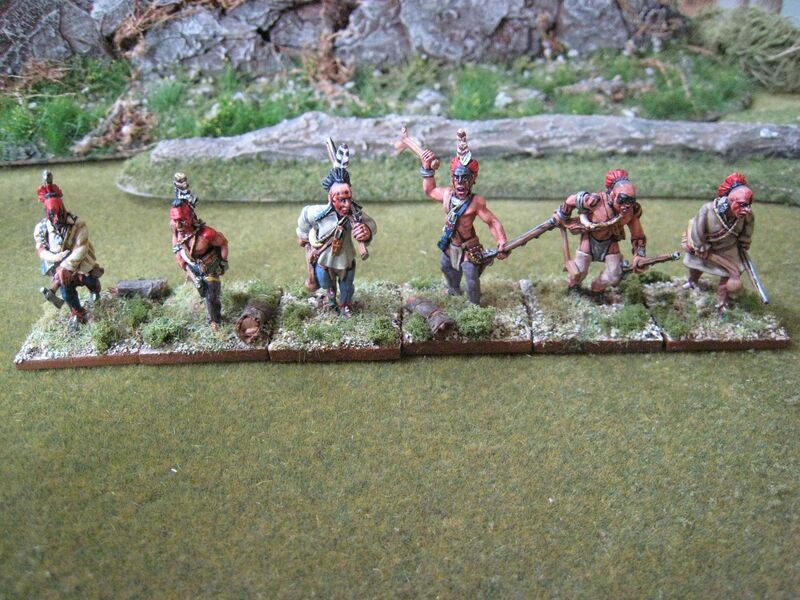 This particular set of figures is called "Iroquois Warriors B". I admit that I have very little idea of the differences between how the Iroquois should look as compared to the Saux/Fox, the Miami and the other specific nations made by Conquest. There are noticeable differences in the types of clothing that the figures wear and the various Osprey MAA books I've consulted suggest different types of war paint. But I confess that I've painted these with a fair amount of artistic licence, although I have looked at paintings by Troiani and others and those in the Ospreys and so I've tried to not completely make it up. The colours are largely muted browns and blues, and wampum bead patterns on the bags and other bits of equipment. The war paint is largely taken from modern illustrations. I make no claims whatsoever about knowing what's "right" when painting native Americans of this era, so please excuse any mistakes. - Indian Field: 12 Stockbridge Indians. 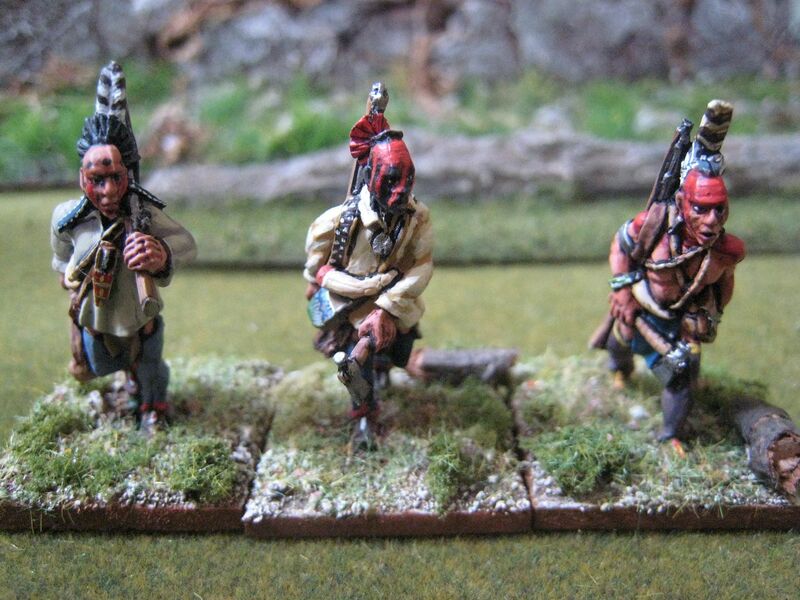 There is flexibility on the number Indians required for Freeman's Farm because the scenario calls for a unit of skirmishers that can be made up of "Tories and Indians"; the number above is the total for the unit, so you can have fewer Indians and instead use Loyalists. So a couple of packs of Indians will cater for most AWI needs. Oriskany presents a challenge - firstly on numbers and secondly on basing. A third point one might also think about is modelling the different tribes/nations - Seneca and Iroquois on the Crown side and Oneida on the Patriot side. 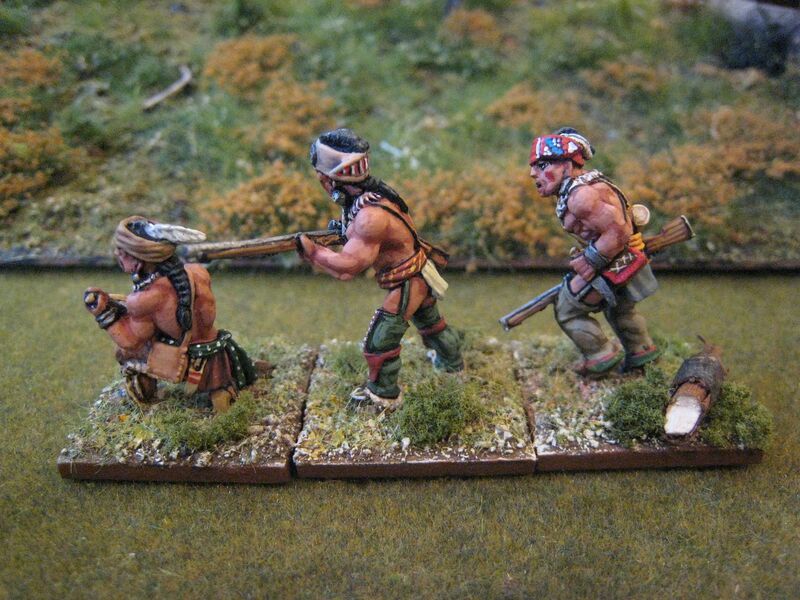 I've noted above that I haven't really made any attempt when painting to differentiate between the tribes sold by Conquest (and indeed the Perries sell their figures as "woodland Indians"), although some figures do look quite different to the more generic ones. 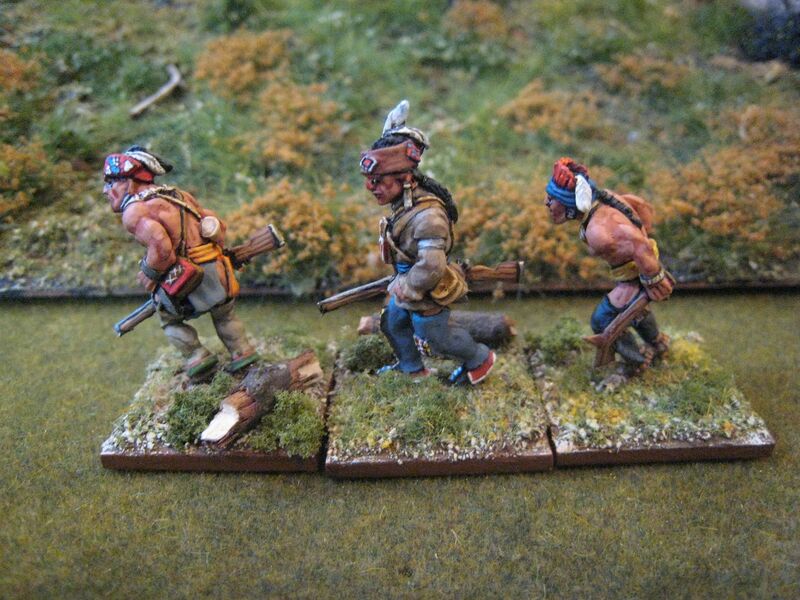 So, for example, one might consider using the rather distinctive Delaware Indian packs for, say, those fighting for the Patriots, if you think it might get confusing on the tabletop which figures belong to which side. 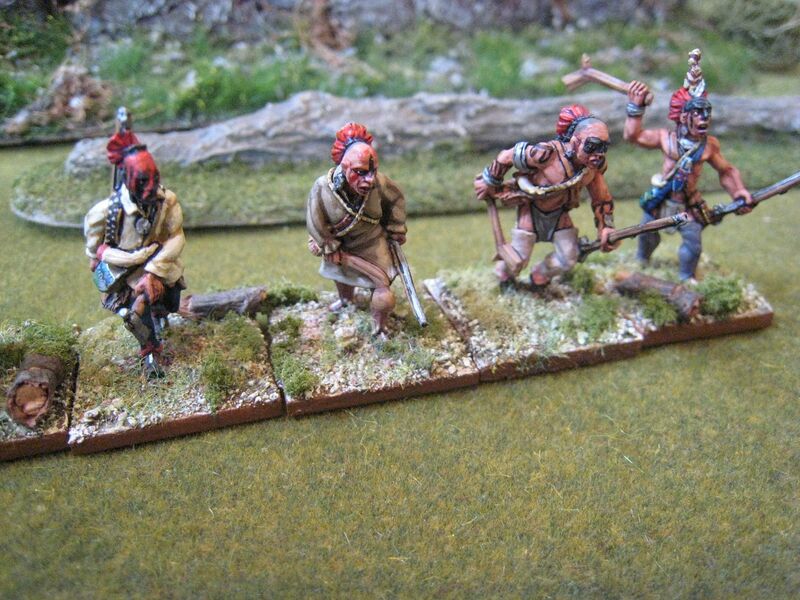 As for numbers, building a large force of Indians isn't difficult as there are so many different figures available in 25mm - I have Perry, Conquest and Galloping Major in my collection, but there are others available too; for example, Crusader Miniatures have some nice ones, although the poses are rather static when compared to the aforementioned. 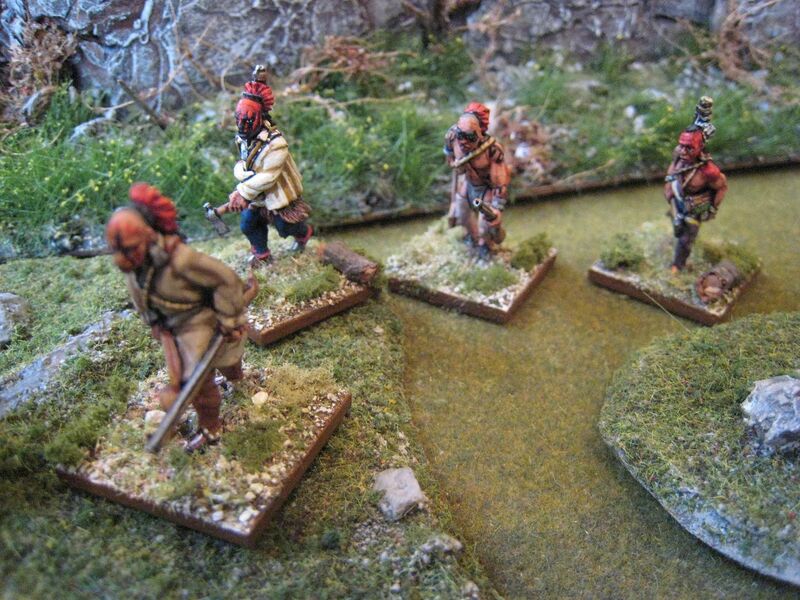 I started off basing my Indians as skirmishers on single 25mm x 25mm bases. I did think about basing new figures on larger bases in multiples, but then decided to stick with single bases for consistency. 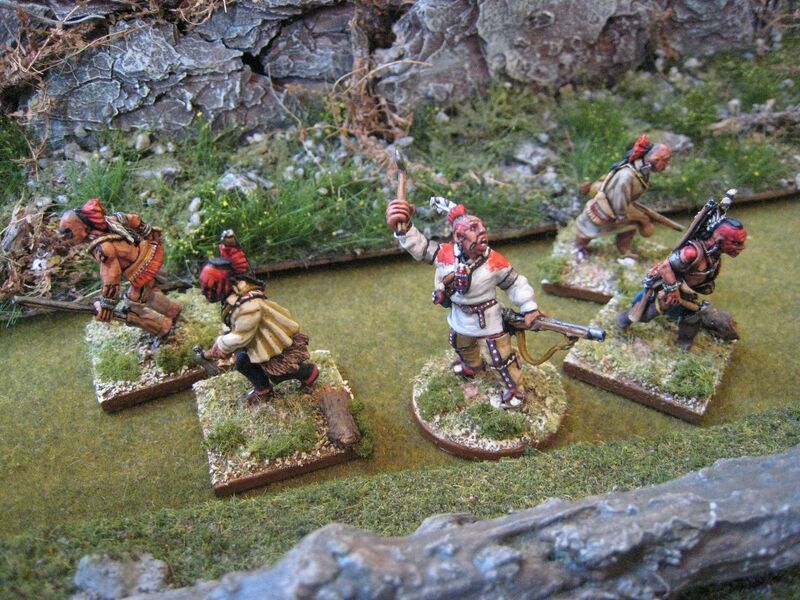 I'm minded to buy a couple of "movement trays" (something I vowed never to do) if I find myself preparing for an Oriskany game. 6 figures. Painted October 2016. 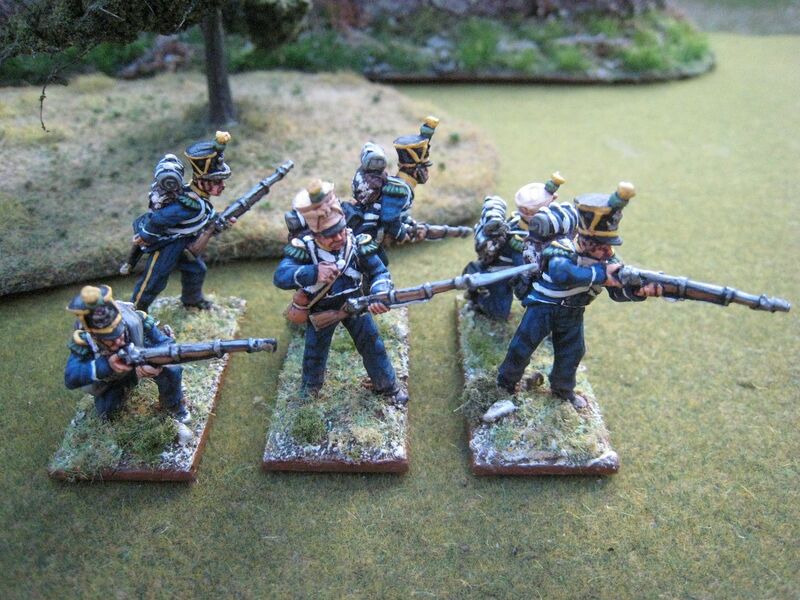 These are Perry Miniatures French light infantry skirmishers from their 1815 range. Five are metal figures and chap about to bite his cartridge is from the plastic box set. He was required because I used one of the figures from the metal pack for my General Bauduin command stand. The 13e Régiment de Légère was in Donzelot's 2nd division in the French I Corps. Therefore, it participated in the initial main French attack on the Allied centre, with Donzelot's division the force that had the first bite at Las Haye Sainte. 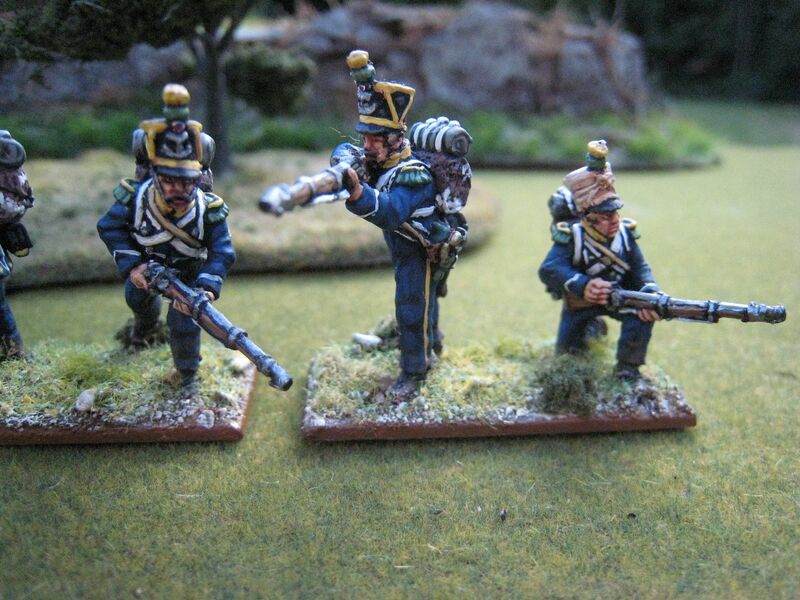 In the GdB order of battle, the 13e has two full-strength battalions of 36 figures; so these light infantry represent one voltigeur company in skirmish order. The bases are the plastic Renedra ones that come in the Perry plastic box. At some stage I'll get around to painting up the 13e's two battalions, but that's some way off at the moment. 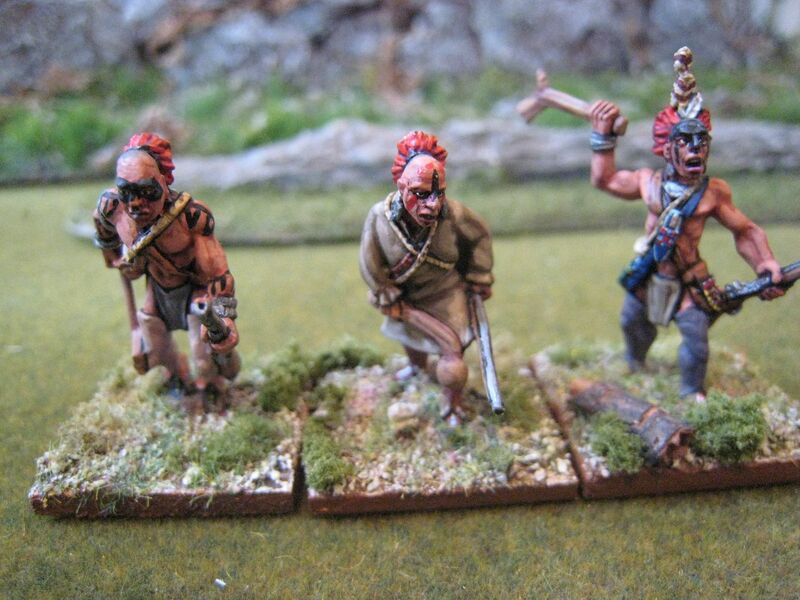 I painted these figures ages ago and then forgot about them. I'm posting about them now as I'm a bit short of photos of other stuff at the moment. I have various AWI bits going through the basing process and hopefully I'll catch up and photograph those at the weekend. 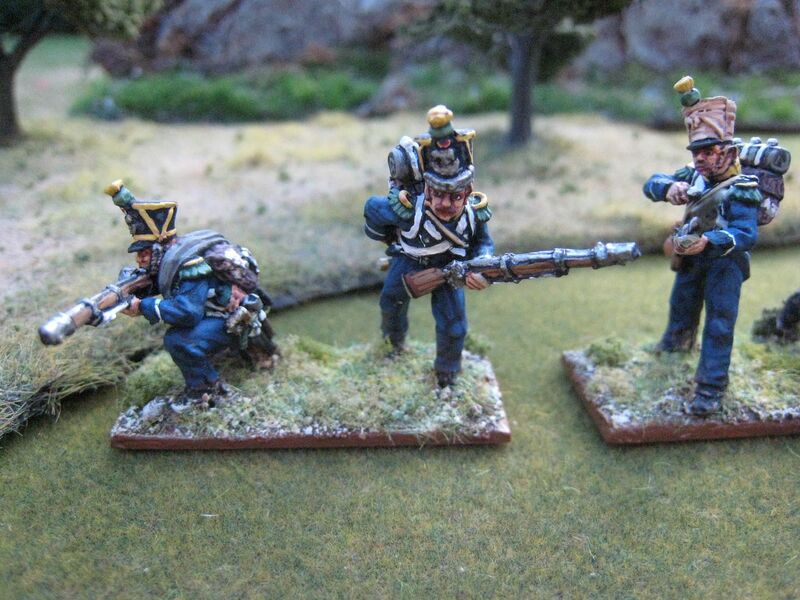 This post reminds me that I have a large number of 1815 French staff figures waiting to be based - I keep changing my mind about how to do that. 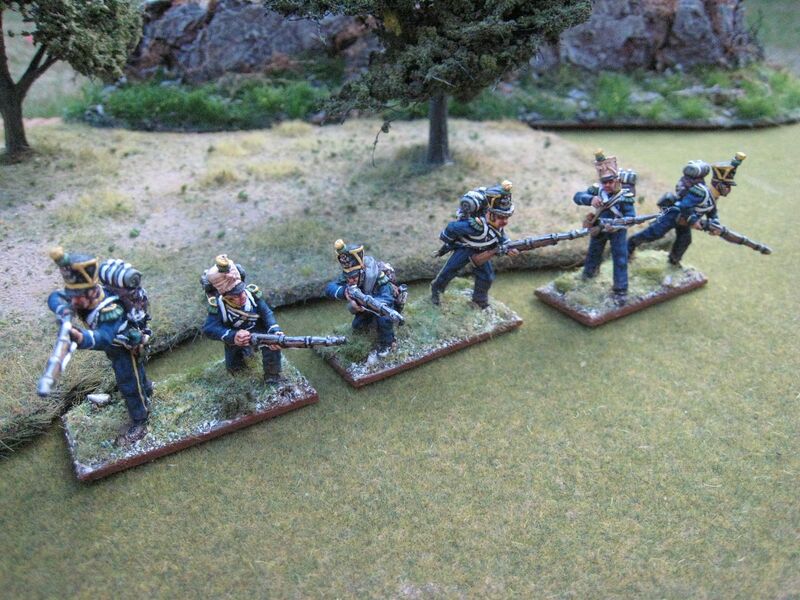 I also have a half-painted battalion of Perry metal "at rest" line infantry, which I need to finish off. 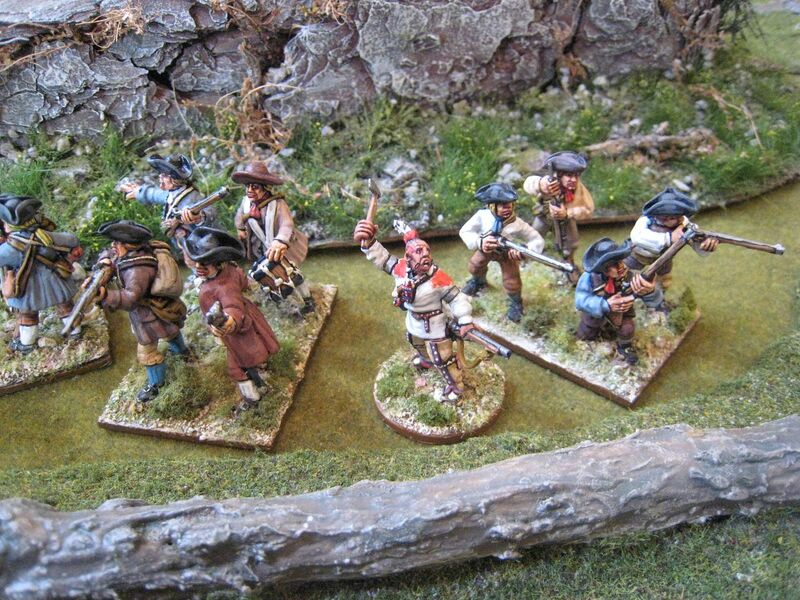 In terms of what's planned for the balance of 2016, it's going to be all AWI: more Indians from Conquest Miniatures, the King's Royal Regiment of New York (Perry plastic British), another couple of Continental infantry regiments and some odds and ends (and some commission work). It will be a bit of a stretch to paint everything that's left in my AWI metal leadpile, but I've already made very good progress on that front. 6 figures. Painted January 2016.